German engineers designed Gecko® gaffs to fulfill the comfort needs of modern tree and utility climbing personnel without all the weight and mass associated with traditional-style spurs. Weighing in as the lightest aluminum climbing gaffs available today. Gecko® climber's provide owners with the perfect balance of gaffing effectiveness and product longevity. The primary feature that affects gaff comfort is the relationship between the human form and mechanical brace. 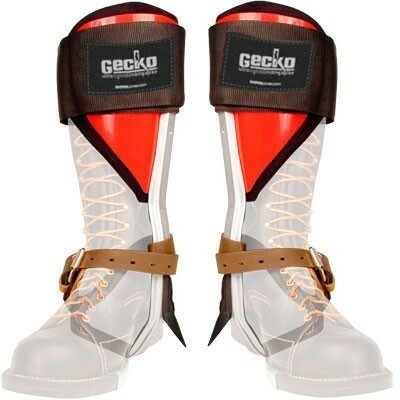 Gecko® gaffs aluminum alloy leg shanks were scientifically designed to cup the foot arch, bypass irritating contact with the ankle,and gently brace against the upper shin. There is no super-wide, triple-thick, metal-enhanced, double-strapped mattress required to keep Gecko® gaffs secured to one’s leg and no steel adjustment sleeve to add weight. Gecko® climbers are sought for their unique simplicity and minimalist features, their adjustable fiberglass shin cuff with Velcro®-attached washable padding, their sleek form, and, most of all, ideal comfort. Comfortable, lightweight, cool, smart spur design… what are you waiting for?